Running with a group is a great idea to keep yourself safe and build your confidence. You can run alone. But joining a running club, group or team provides some extra benefits. Living in a big city will help you to get a running group easily. Running alone will sometimes keep you away from the regular run. But when you run with a group, you will get a tendency of running on the daily basis. It also improves your running quality and encourages you to take part in a race. 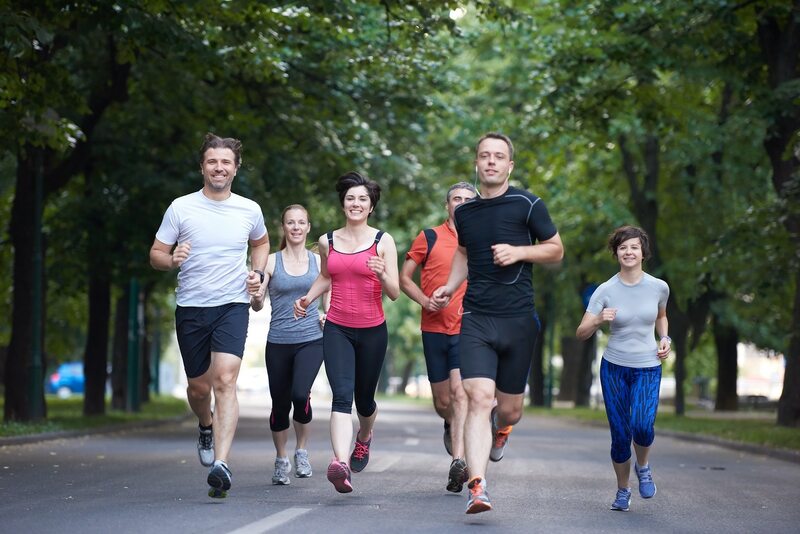 Let’s see some benefits of running with a group or joining a running club. As running alone is not safe for you, you can run with a group which is obviously safer. You will not get lost when you run in a group though you have done any wrong turn. You need not listen to the music and feel alone while running with a group. Besides, when someone of the group gets sick or injured, others come there to help him/her. Attackers also do not like to attack someone in the group. When you join a running club or group, you will get your personal, encouraging squad. The members of your group will encourage and support each other during any race. They also motivate you to stick to the training and become a successful runner. Some people like to run alone because at this time they can think something about their day. But when you run in a group, it will provide you some creative juices more than running alone. It also helps you to bounce some ideas of others and also you can ask them on any problem of your workout. Everyone wants to become successful in the healthy competition. When you run with other people, they will inspire you to run faster. It will help you to go to the next level. Running alone can tempt you to make your workout short. But try to run with some buddies who encourage you to run extra. Group running increases the great sense of community. When you run together or volunteer at a race, you will be connected to many other people. Besides, you will feel yourself a part of a big thing. All the runners are related to every runner and also supportive of each other. To be a good runner, you should do training or practice regularly. Running group will help you by motivating each other. When you join a running group, you will meet up the runners, and it will give you the consistency. It makes sure that you are stick to the training. Group running benefits us on the psychological level. This term is known as “Social Facilitation”. It means group running helps the person to run with more effort than he usually does. It will also help you to run faster. I know from a person who ran 3 miles when he ran alone. But when he joins a group, he runs 5 miles. Running alone can make you bored. But when you take part in running in a group, you can run faster, and there is no chance to get bored. You can also explore new routes with your group. You can talk to them on any matter. Running in a group is interesting. Joining a running group will provide you the excellent opportunity to make new relation to the people with related interests. Through a running club, you can get close friends and significant other. Some runners try the destination races with the friends they have met in the running clubs or group. You may not know all the running tips. So, run in a group makes it easier to learn everything from each other. You can also share your experience with others. So, it is a collection of wisdom that benefits all the members of a group. Every runner likes to talk about running during his run. Every runner needs mental strength to keep him pushing through. In a group running, there are many people who assist you to run when you seem that it is tough for you to continue running. So, you can efficiently and successfully end your race. As a member of a running group, the tendency of any excuses will decrease gradually and you will stick with the run on the routine basis. Though you have a busy day, your group will motivate you to take part in running. You may think that people are waiting for you and there is no chance to show any excuse. When you decide to run regularly, it will be harder for you. But run in a group will remove your fear and make you confident. You can run five miles easily with your group, but it was harder for you before. It will make your mind strong. So, we see that running in a group makes a runner confident in his own capacity. Some places are well-known for running in your town. But you do not run there while you run alone. But running with a group will help you to make you familiar with these new places. It is like an adventure. You can enjoy and refresh yourself on the new route with others. It seems a new world to you. We know that most of the running groups have their different purposes such as for beginners, social running, online group and elite squads of running. But the common thing is that all the members love running and want to talk about running. The person who is new at running will get the help of others with some tips and training or run chat over a cup of tea.